A long, long time ago one of my early photography instructors gave me some sage advice. She said, “Whenever you are out with your camera, always remember to stop every once in a while and look behind you.” I’ve always remembered her words of wisdom, and do often pause in my work to turn around and check out what I’ve left behind or what might be following me. On this particular day, after working with a client at her home, I was leaving her driveway when I took one last look. 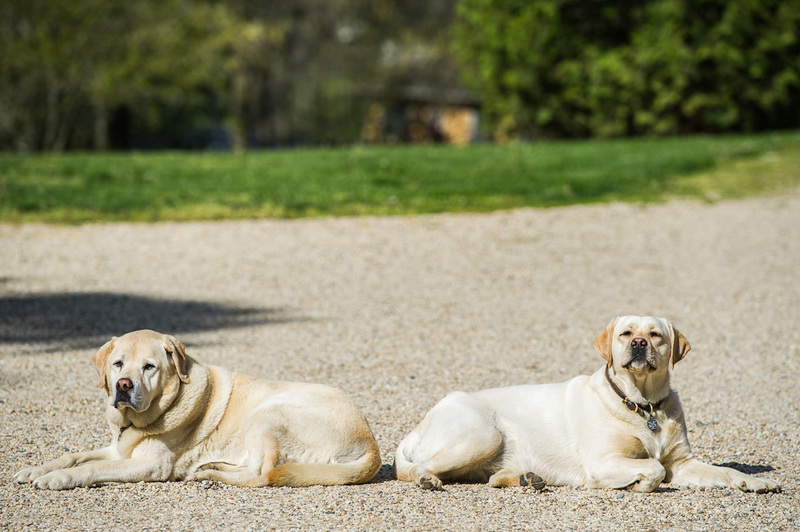 There, sitting in unison, were the yellow Labradors Sawyer and Heidi keeping watch over their domain. I quickly grabbed my camera and took a few shots from the truck. As you can see, Sawyer wasn’t worried about my activities, but Heidi gave me one last inquisitive look, just to make sure I was safely on my way out. So, while it’s aways great to focus on what’s ahead, sometimes what’s behind you is well worth a few extra moments of your time. This is so true…often times we get caught up in the moment we mess special moments like this. Well done Tricia!! Many decades when I was a personal safety instructor, the first thing we told our clients was to look around you and notice what’s going on. Especially look behind you every few minutes.